Welcome back to the Osborne Recipe Box! Winter is that time of year where you may only have a handful of vegetables or crops to choose from for your ingredients list for dinner! Whether it be Radicchio, Onions, Potatoes or other over-wintering crops, we have a few recipes for you to try! If you're looking to cook with Sirio, Rosalba, or other types of Radicchio you have on-hand, try this recipe out. Chili powder (only for those that are feeling adventurous)! 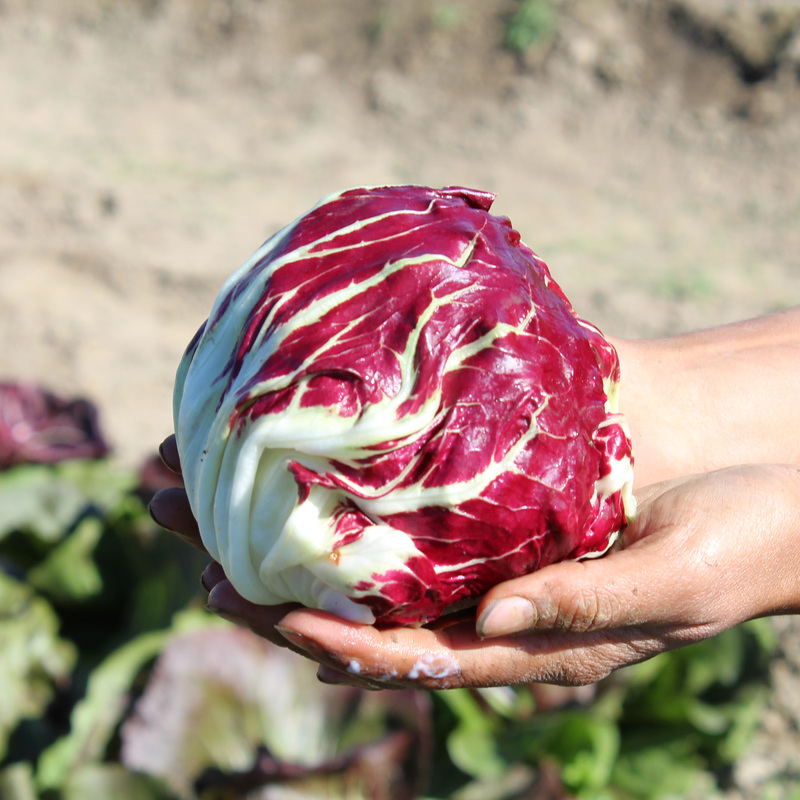 Start by cutting the Radicchio head into quarters and discard the core. Then, sauté all ingredients together in a pan on medium-high for 8-10. Once the Radicchio is sautéed to your preferred perfection, turn off the stove and let sit for 2 minutes. Place in a serving bowl and enjoy! This makes a great side dish, or pairs well with your choice of protein (chicken, beef, tilapia, etc). If you're looking for a little more variety and hardiness, baked vegetables are always a tasty way to go. Start with Parsnips, Onions, Carrots and of course, Garlic. Preheat the oven to 425 degrees. 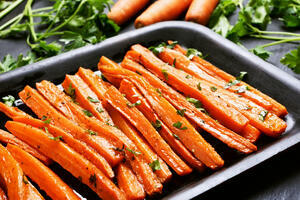 Start by cutting the Carrots and Parsnips into strips (like the above picture), place on cookie sheet. Mince the garlic, and chop the onions, sprinkle across the cookie sheet as well. Then take the cubed butter and place them evenly across the vegetable arrangement. Mix together brown sugar, avocado oil, bourbon, and sea-salt, put aside. Place vegetables into the oven and bake for 22-25 minutes. Once the time is up, pull veggies out of the oven and drizzle brown-sugar sauce over the arranged vegetables coating as evenly as possible. Place back in over for 5 minutes or until vegetables are soft. Pull vegetables from oven and place on a plate to serve and enjoy! Another recipe we came across was sautéed Radicchio, Bacon, and Pears! This one was especially delicious because it has a balance of savory and sweet flavors. Mix together the oil, balsamic vinegar, mustard, salt, pepper, and garlic. Set aside for now. Next, fry up the bacon, then chop it into large chunks. Drain the pan of most grease, and then sautée the radicchio and pears in the remaining grease until it turns golden brown. 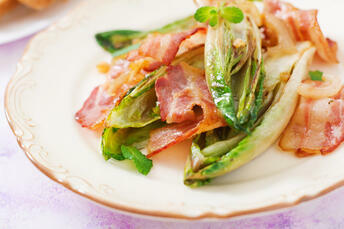 Drizzle the vinegar dressing over the radicchio and pears, top with the bacon and enjoy!